The 2018 Eastern Pacific Hurricane Season officially wrapped up December 1, but the basin has been quiet since Xavier fizzled out on November 5. The statistics for the season are in and the facts continue fly in the face of Climate Change doubters. The 2018 Eastern Pacific Tropical Cyclone Season set records, and not in a good way. In 2018 the Eastern Pacific generated a record tying number of Category 5 tropical cyclones, a record setting number of 9 Major Hurricanes and perhaps most importantly, the highest ACE score ever recorded in a single season in the Eastern Pacific. The year was also the second most active year in history making it down the Xavier. 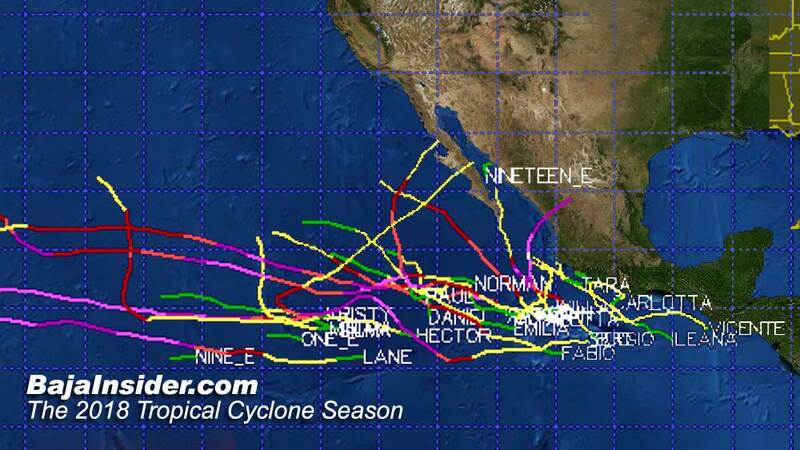 Only 1992 had more named systems, making it for the first time to Hurricane Zeke. The Eastern Pacific started tropical cyclone activity slightly later than average, on June 6th, but with a bang of a Category 4 cyclone which moved harmlessly off into the open Pacific. The first system to threaten the peninsula was a record setter, as it was the second earliest named system to make landfall on the peninsula. Hurricane Bud spun up off the southern coast of Mexico on June 9th and moved in an a-typical path to the north-northwest. Maturing to Category 4 things started to look dismal for the tip of the peninsula full of end of the school year tourists. 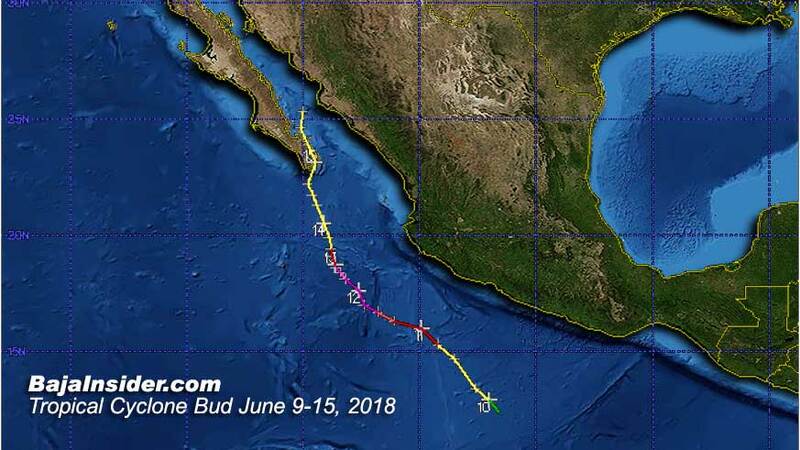 But the colder waters south of the peninsula reduced Bud to a Tropical Storm before making landfall near Cabo Pulmo in the early hours of June 15. Bud then moved north along East Cape and dissipated about 60 miles northwest of La Paz. Only Blanca in 2015 threatened the peninsula any earlier, with landfall on June 8, 2015. Both Blanca and Bud were the result of a very strong Madden Julian Oscillation which traveled significantly further north than usual for the season. The systems pushed back the earliest known landfall of a named system by more than 65 days. The next three storms, Carlotta, Daniel and Emilia never matured past Tropical Storm intensity, but Carlotta brought significant early rains to the southern coast of mainland Mexico. Fabio which followed only matured to Category 2 and moved off into the Pacific without threatening landfall as did Tropical Storm Gilma. Hurricane Hector became the third Major Hurricane of 2018 but posed more of a threat to the Hawaiian Islands in the Central Pacific basin. Tropical Storm Ileana again saturated the Pacific coast of southern Mexico, and Kristy was Tropical Storms that didn't threaten landfall as they moved west into the Pacific. 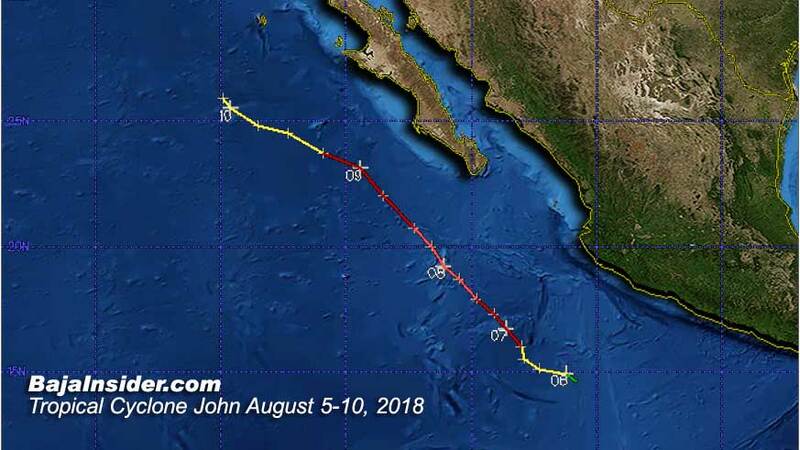 John made it to Category 2 status and for a short time had us on alert in the second week of August as it passed a couple hundred miles southwest of the peninsula. With the exception of Category 2 Miriam and Tropical Storm Paul it was the season of the monster storms. Hurricane Lane and Sergio achieved Category 5 status and Norman, Olivia and Rosa achieved Category 4 status. Hurricane Rosa came in the last week of September just when the peninsula begins to gather hope that we will make it to the end of the season. Hurricane Rosa turned north from a location that only one other system in history (since 1948) has ever made and in traveling to the north-northeast made landfall in the northern state of Baja California. 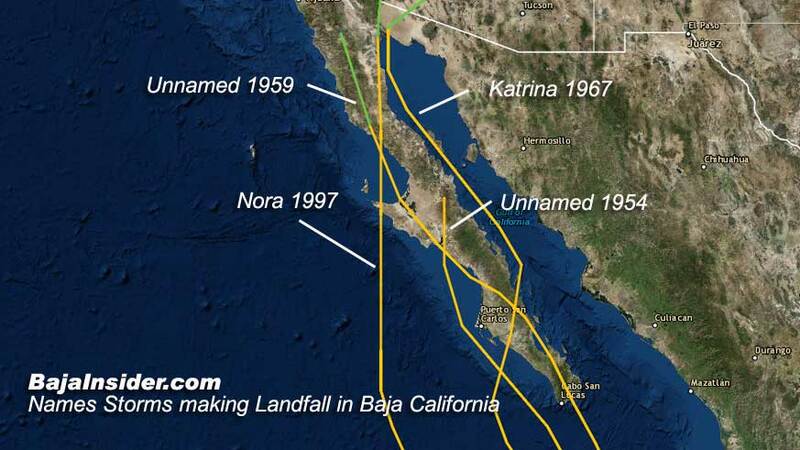 Since 1948 only four other named systems have made landfall in Baja California. Just when we thought we'd seen it all along came Hurricane Sergio. 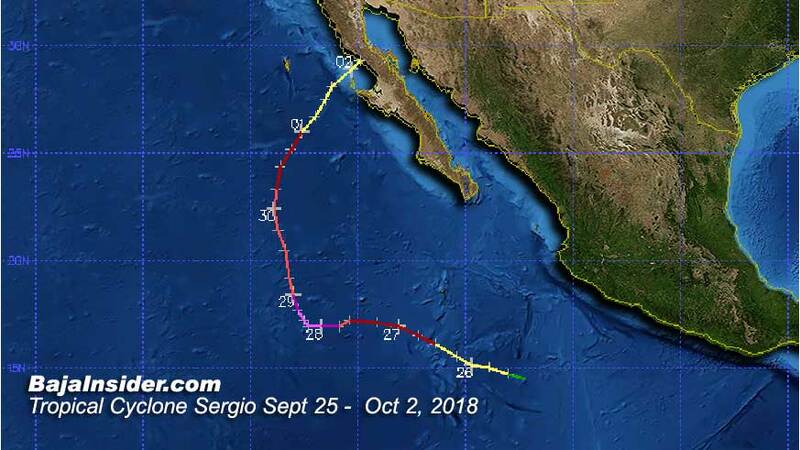 Sergio became the longest running system of the year at 15 days as it moved west along the normal track out into the Central Pacific. But from the onset, forecasts called for Sergio to make a dramatic turn and return to the northeast and they were correct. Sergio made a 170° turn and headed back toward the peninsula, a stunt that no previous tropical cyclone had ever done before. 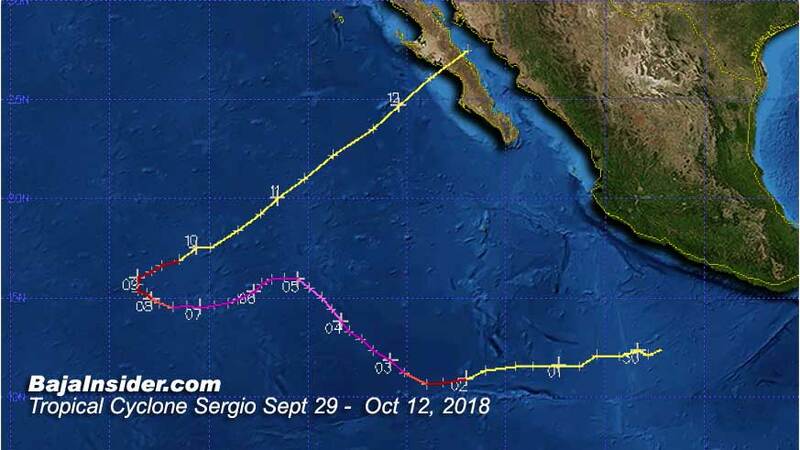 Sergio was reduced by the colder waters to the west of the peninsula and for a second stranger than normal occurrence, made landfall in the northern state of Baja California as a Tropical Cyclone on October 12. The last weeks of October remained uncharacteristically active with Tropical Storm Tara and Tropical Storm Vincent dumping rain on the southern coast of Mexico. The end of October brought us briefly to attention again, as Category 5 Hurricane Willa threatened to move up the west coast of the peninsula for a brief time. Willa proved the most difficult system of the season to forecast and showed a breakdown of several of the hurricane models. Will eventually plowed into mainland Mexico just north of Mazatlan as a Category 3 major Hurricane. Tropical Storm Xavier finished out the season wandering around well off the coast of mainland Mexico and died without making landfall on November 5. So 2018 was a active one for the Eastern Pacific, the second most number of named systems, a tie for the most Baja landfalls in one season, the second earliest Baja landfall, the greatest number of Category 5 systems and the greatest number of Major Hurricanes with 9. 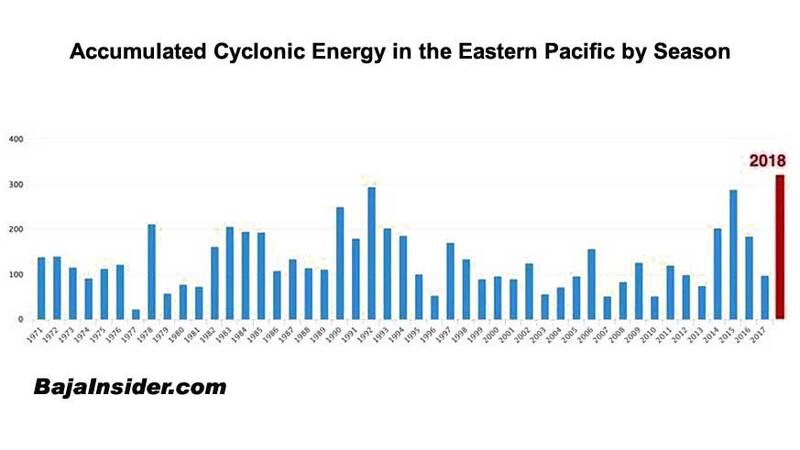 The ACE (accumulated cyclonic energy) was also the highest ever recorded for the Eastern Pacific. The 2018 season also saw the composite track models used by the National Hurricane Center prove just how well honed they are becoming. The projected tracks of all but the last two systems of the season showed incredible accuracy in track forecasts 12-15 days out. Although intensity forecasts improved their batting average this season they still need some fine tuning. What does this mean for 2019? The Eastern Pacific runs in 24-25 year cycles of activity. It appears that 2018 marked the beginning of an more active cycle in the basin. In addition to the normal cyclical activity of the basin the constant over temperature of the Eastern Pacific through the Hurricane Season is likely to bring another 16-19 named systems next year. The ENSO (El Nino Southern Oscillation) is expected to move into an El Nino condition by spring, which also brings increased activity to the Eastern Pacific. But most importantly, what does it mean for me? Well, I was dead on with my early season predictions, estimating three named systems would make landfall on the peninsula, but I expected one of them to be a hurricane. I totally gaffed the last two systems, my models projecting one of them to make a Baja landfall. I guess I just phoned it in after what is usually the end of the season. Overall, it was a pretty easy season to predict, with only Rosa and Sergio throwing curve balls, so up against these easy odds I'm going to grant myself a batting average of .750 for the 2018 season. Note: You may find discrepancies between my data and that of online sources such as Wikipedia. My stats are defined by the NHC definition of the Eastern Pacific while other sources seem to regularly include what the NHC defines as the Central Pacific basin. Tomas has a degree in Climatology from the University of Wisconsin and has been studying and writing about Eastern Pacific Tropical Cyclones for 15 years. He is currently working with a commercial and an educational entity on developing tropical cyclone and MJO study software.